Dial gauges on pressure canners should be tested every year to ensure that the dials are accurate. Weighted gauges on canners do not need to be tested, they do not go out of calibration. The type of testing units available in Extension offices are used with a limited selection of dial gauges, primarily Presto brand gauges. See Guidelines for Dial Gauge Testing (includes a How To Guide!) . Dial gauge canner testing units approved for use in county offices can be ordered from Presto. The master gauge on a tester must be recalibrated every year; Presto provides this service for free to county Extension offices. Presto will also replace parts on the testing unit, upon request. A sample letter requesting calibration services is here. Two videos that show how to use the Presto gauge tester are available; review both for information on using the tester. Oregon State info; info from Univ of Kentucky. 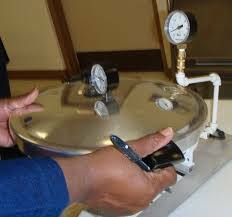 A dial canner testing report must be completed for each canner gauge tested. The Division of Extension canner tester report must be used since it includes the proper language re liability for this service. Give one signed copy of the canner test report to the client/consumer, keep a second copy on file in the county office for 1 year, until the start of the next canning season. Place a sticker with the results of the gauge testing either directly on the canner lid or on the top of the dial-gauge housing. Stickers can be printed using Avery 5160 return address labels (1″ x 2 5/8″) and this template. While only the dial gauge is calibrated, the full canner should be inspected if possible. Both the rubber gasket and overpressure plug should be inspected for wear and/or brittleness and replaced as needed. Many hardware stores carry replacement gaskets, or they can be ordered from Presto. Removing the gasket from the canner lid, drying it off, and placing it, dry and loosely coiled, in the base of the canner between uses will significantly prolong the life of the gasket. The gasket should not be oiled. Powerpoint materials for you to download and edit when you teach home food preservation. Tips for a Successful Year of Food Preservation – Slides. The right equipment and the most up-to-date information will start the season off right. Home Freezing of Foods – Slides. Freezing is an easy method of food preservation. Join us to find out how to freeze foods that your family will enjoy. Canning Basics – Slides. Whether pressure canning or canning in a boiling water canner, there are some basic steps to make sure canning is done right. Making Jams and Jellies – Slides. Learn how to make tasty fruit spreads that capture the taste of summer or fall. Drying Fruits and Vegetables at Home – Slides. Drying foods can be fun! Learn how to get started using this easy food preservation method. 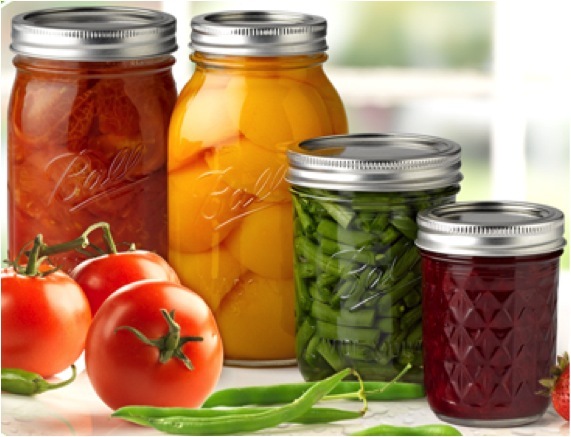 Canning Vegetables Safely – Slides. Turn up the heat (and pressure) to safely can garden vegetables. Canning Tomatoes and Tomato Products – Slides. Join us for tips on canning tomatoes tart and tasty. Canning Fruits Safely – Slides. The bounty of the orchard preserved for the winter, tips on canning fruits safely will be shared. Time to Make Pickles– Slides. Learn tips for making pickles that are safe enough for Grandma to enjoy (and tasty too). Fermenting Foods at Home­– Slides. Sauerkraut, genuine dills and yogurt are delicious fermented foods easy to prepare at home. Storing Fruits and Vegetables – Slides. Learn how to enjoy the bounty of farm and orchard for months to come. Preserving Meat Safely­ – Slides. Dried, frozen, or canned – we’ll discuss tips for preserving safe, high quality meat.